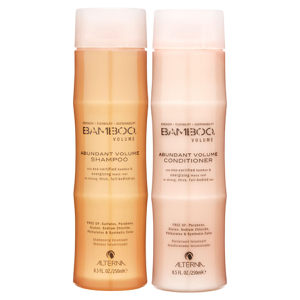 BAMBOO Volume Abundant Volume Shampoo combines strengthening pure organic Bamboo Extract and stimulating, phyto-nutrient rich organic Maca Root in a gentle sulfate and sodium chloride free formula that cleanses and energizes hair with weightless moisture for a fresh, full-bodied look. Because great hair should be sustainable. Gentle, daily use volumizing shampoo. Infuses hair with weightless moisture and vital nutrients for healthy volume. Makes hair look fuller and feel stronger. Protein-binding amino-acids penetrate the hair shaft to naturally rebuild and thicken it. Massage throughout wet hair & scalp. Rinse thoroughly. 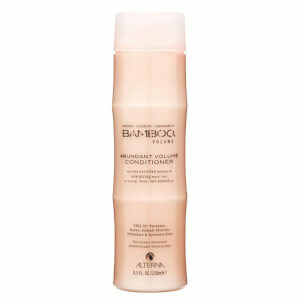 Follow with BAMBOO Abundant Volume Conditioner for optimal results. Water (Aqua), Cocamidopropyl Betaine, Disodium 2-Sulfolaurate, Sodium Methyl 2-Sulfolaurate, Cetrimonium Chloride, Sodium Methyl Cocoyl Taurate, Bambusa Vulgaris Water, Wasabia Japonica Root Extract, Bambusa Vulgaris (Bamboo) Extract, Lepidium Meyenii (Maca) Root Extract, Panthenol, Glycerin, Helianthus Annuus (Sunflower) Seed Oil, Hydroxypropyltrimonium Honey, Paullinia Cupana (Guarana) Seed Extract, Serenoa Serrulata Fruit Extract, Hydrolyzed Vegetable Protein PG-Propyl Silanetriol, Hydrolyzed Soy Protein, Rice Amino Acids, Hydrolyzed Cottonseed Protein, Silicone Quaternium-8, Lauramide MEA, PEG-150 Distearate, Methyl Gluceth-10, Polyquaternium-55, Silicone Quaternium-16, Amodimethicone, Sodium Benzoate, PEG-120 Methyl Glucose Dioleate, Panthenyl Hydroxypropyl Steardimonium Chloride, Undeceth-11, Linalool, Butyloctanol, Disodium EDTA, Undeceth-5, Aminomethyl Propanol, Limonene, Phospholipids, Methylchloroisothiazolinone, Methylisothiazolinone, Polygonum Multiflorum Root Extract, Azelaic Acid, Calcium Pantothenate, Calphostin C, Magnesium Ascorbyl Phosphate, Magnesium Salicylate, n-Carboxyethyl Butyric Acid, Niacin, Ornithine Decarboxylase, Phosphorus, Retinyl Palmitate, Threonine, Tocopheryl Acetate, Zinc Gluconate, Polyquaternium-10, Silanetriol Melaninate, Superoxide Dismutase, Hydrolyzed Pearl, Bromelain, Papain, Fragrance (Parfum). I use this shampoo every day without any observable damage to my hair. On the contrary, this shampoo leaves my hair soft, and full, looking and feeling healthy. Solid choice in a world of chemical products. I'm a guy with longer hair and wanted a shampoo without a slew of weird chemicals that disrupt my nervous system. There are ingredients in here that I haven't researched but all the red flag ingredients are absent. This shampoo gives a good wash and when my hair dries it has a good enough weight and nice amount of body, so I don't need to put any product in it. This shampoo weighed my hair down more than it volumized. It smells good and is relatively natural compared to many other brands, but it did not work for my fine hair.